NC State Dining is gearing up for the 2017-2018 school year with improvements not only to meal plans but also to its operations. Student Meal Plans: NC State Dining has new meal plan options, including the Weekday, Everyday and Deluxe Plans. These plans feature an all-access pass to the dining halls, includes additional Meal Credits each week for use in retail dining locations, and creates two lunch opportunities each day for Meal Credit use. With the all-access pass, you can come and go when you’re hungry to our three all-you-care-to-eat dining halls and enjoy a full meal or a light snack, and with the new guest meals you can bring a friend, too! Dining Halls: Fountain Dining Hall received a makeover with new action stations, menu items and a new hot pizza program. Look for paninis, bowl concepts, ethnic cuisines and more opportunities to customize. Plus, diners will experience more frequency of popular items, such as stir-fry dishes, pizzas, burritos and pastas. Fountain also has upgraded its tile floors, carpeting and new dishes, too. All of the dining halls have received upgrades to the juice and water dispensers, plus new specialty coffee dispensers that make lattes, mochas and Caribou coffee. Diners will also see a change of pace and additional theme meals this year. Talley Student Union | One Earth: The staff has re-engineered the popular Asian station with a new large grill station for faster service and new express options. The Mediterranean station has been retooled to offer global bowls and wraps with a variety of grains, roasted vegetables and exotic condiments. The station will also have more vegan, vegetarian and healthy choices. A new salad bar with greens, vegetables, fruits, toppings, dressings, composed salads and protein options will launch in September. Talley Student Union | Pavilions: Red Sky Pizza is expanding its menu to include lasagna, cannelloni, toasted subs, spanakopita and vegan pizza. Los Lobos, Tuffy’s and Jason’s Deli will have monthly specials such as a sweet potato waffle with praline topping, Philly cheese steak, smothered burrito and grilled salmon salad, to name a few. On The Oval: Newton’s Diner is getting a makeover and a new name- Gravity Cafe, which will expand and improve the evening and weekend offerings on Centennial Campus. Grill classics will still be available but the focus will be on new, made-to-order entrees, global favorites, specialty sandwiches, fresh-made salads and Wolf Approved items. Gravity will feature more plant-forward menu options for the growing vegan/vegetarian population on Centennial Campus, too. The Fahrenheit and Global stations will have a new four-week menu rotation featuring new sushi, Indian, and Thai choices, plus premium offerings such as salmon, barbecue ribs and flank steak. An expanded grab-and-go section will appeal to those who want to eat well on the go. Atrium Food Court: Smoothie U amping up offerings by adding Sambazon acai bowls and smoothies. We are also adding more clean label smoothie recipes and a gluten-free oatmeal. The Wolfpack To-Go grab-and-go section will have more variety and healthier options, such as bundled snack packs, salad shakers, fruit, gluten-free chips and cookies. You will also find freshly-baked cookies at the register. Catering for Student Groups: Rave! Events worked with student leaders to make adjustments to the student organization catering menu options and pricing. 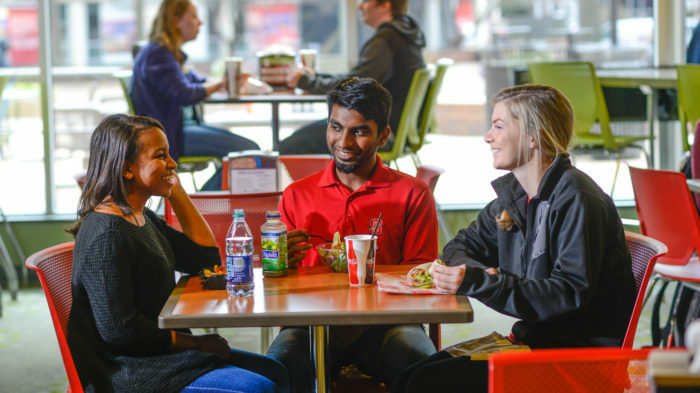 Students organizations can also receive 15 percent off options listed in the main catering guides designed for Talley, Hunt Library, Lonnie Poole Golf Course, and Park Alumni Center. C-Stores: Meal Credits are now accepted at the ice cream counter at Talley Market, allowing students to purchase Howling Cow ice cream and milkshakes using a Meal Credit. Vending Machines: More healthy options in campus vending machines as well as the addition of the NC State Dairy Power Pack at Carmichael Gym. State Club Restaurant | Park Alumni Center: NC State Dining is in its second year operating this great lunch spot. The culinary team has added more healthy and 30-minute lunch options. Executive Chef Gerry Fong invites you to experience the finest cuisine on campus at the State Club Restaurant. Terrace Dining Room | Lonnie Poole Golf Course: Enjoy afternoon food and drink specials, plus a new seasonal menu introduced in early September. The restaurant added weekend brunch earlier this year. The three-course monthly dinners continue to be a popular event, with reservations and information found at go.ncsu.edu/dinnerattheterrace.